Coimbatore, October 26, 2018: The opening 12th Hero I-League encounter between Chennai City FC and the Indian Arrows at Coimbatore’s Jawahar Lal Nehru Stadium, turned out to be a happy outing for the boisterous home fans. 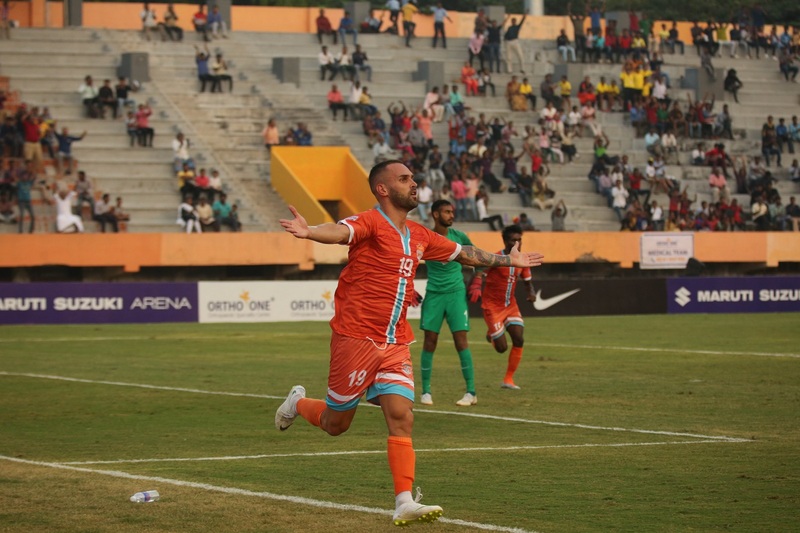 Riding on Uruguay-born Pedro Manzi’s hattrick, Chennai City FC outplayed a young Indian Arrows side 4-1, logging full three points to begin their campaign in style. Romario Jesuraj, who had an outstanding game, scored the fourth. Indian Arrows captain Amarjit Singh Kiyam, however, opened the scoring with a second-minute strike to give the young side an early lead. Chennai’s Singaporean coach Akbar Nawas opted to go with Pedro Manzi as the sole striker with wingers Nestor from Spain and Romario Jesuraj assisting him. Another Spaniard, Sandro operated in the middle of the attack. Gaurav Bora was in the defensive midfield role just ahead of a three-man back line. Floyd Pinto, the Arrows coach, left Rahul KP ahead with Rahim Ali in a roving role and Amarjeet Kiyam and Stalin holding the fort in the centre of midfield with Jeakson Singh behind them. Prabhsukhan Gill, in goal, was supported by a four-man defence. The Arrows could not have asked for a better start as captain Kiyam struck in the second minute. Rahul KP, who had a fantastic first half with his deft touches and languid runs causing lots of problems to the left side of Chennai’s defence, went on a run down the right flank and his cross across goal saw the Chennai keeper Kabir only manage to parry the ball in the path of an onrushing Kiyam, who slotted home calmly. The early goal was a definite wake-up call for the hosts, as they sprung into action, in particular, the combination of Nestor Jesus and Pedro Manzi. The first glimpse of things to come was evident in the fourth minute, when a 1-2 between the two, found Manzi in the clear inside the box but he failed to score the equaliser. Chennai had two clear chances in the rest of the first half which they clearly dominated. First, Nestor missed a sitter in the 18th minute as Jesuraj’s cross from the right found him with a free header and an open goal six yards away. He lobbed the header over the bar. Then in the 46th minute, from Sandro’s lob inside the box, Manzi had to just lob an onrushing Prabhsukan Gill in the Arrows goal, but his effort ricocheted off the bar. In between, Manzi struck from the first time in the 31st minute to get Chennai back to level terms. Nestor left Narender for dead on the right side of the Arrows defence and cut in to unleash a wonderful through-ball inside the box. Manzi turned Gill with his first touch and then slammed home with his second, from a narrow angle in the end. The Arrows again had a chance to draw level early in the second half but Rahim Ali muffed a chance from inside the box. In the 49th minute, Manzi put Chennai ahead controlling a lob with his head and then shrugging off both Narender and Asish Rai with sheer power, before unleashing a left-footer from the instep to beat a diving Gill across the mouth of the goal. The Uruguay-born forward then completed a deserving hattrick in the 64th minute, when Chennai were awarded a penalty as the ball found a falling Anwar Ali’s trailing hand inside the box, from yet another Nestor-initiated move. The match was played in good spirits in general, however, referee Santhosh Bhaskaran did have to flash the yellow card to a couple of players. Jitendra Singh picked up a booking in the 14th minute while Chennai’s Kamaraj went into the books in the 82nd minute of the game. Super Saturday beckons next as Manipur’s Neroca FC host Quess East Bengal at 2 PM on October 27, 2018. This will be followed by a 5 PM kick-off on the same day for the 12th Hero I-League’s third game at Kozhikode between Gokulam Kerala FC and Mohun Bagan.